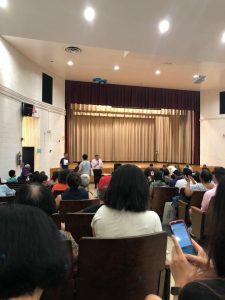 CAAAV works to build grassroots community power across diverse poor and working class Asian immigrant and refugee communities in New York City. 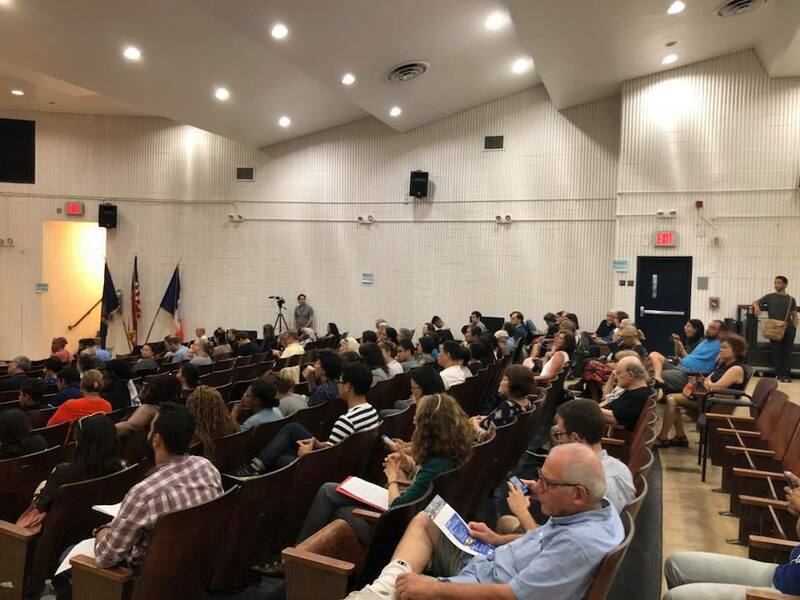 On August 14th, Community Board 3 had a public hearing where local organizations, tenants, and supporters gathered to share their concerns regarding the Two Bridges Large-Scale Residential Development proposal projected to build three high-rise buildings in the Lower East Side. CAAAV is in alliance with local groups Good Old Lower East Side (GOLES) and Tenants United Fighting For Lower East Side (TUFF-LES), Council Member Margaret Chin and Manhattan Borough President Gale Brewer in opposing the development of these towers because it will change the landscape, livelihood, and day-to-day life of long-time residents. Developers are planning on improving the East Broadway subway station, building a playground, and a community center in the neighborhood if the proposal is approved, but our elected officials, community members, and allied organizations are more concerned about the negative impact these high-rise buildings will bring forth for the neighborhood. As an organization that fights for preservation of rent-stabilized housing and affordability for working-class residents, we know that these high-rise towers will promote secondary displacement, dramatically spur gentrification, and school overcrowding. There are about 80% rentals in the surrounding area that are rent-stabilized or have state regulations that prevent rent to coincide with market rate housing. JDS Development Group is proposing to build their tower immediately above the 80 Rutgers Street senior housing building which means that some seniors living in this building will have to relocate during construction. The CB3 meeting allowed the general public to give their comments on the proposal because the Environmental Impact Statement (EIS) was released in June. Therefore, we think a public review of the developers proposal is just as important because communities living in the LES and Chinatown have firsthand experiences that hold just as much weight as the environmental technicalities that the EIS has produced. The next steps for CAAAV is to organize our members to join a town hall meeting coordinated by our allies GOLES and TUFF-LESS sometime in September. Organizing our members to join this meeting will provide space for CTU members and community members from the Lower East Side to learn more about the developer’s proposal and see what our community can do to combat the building of these high-rise buildings. This meeting will also prepare members and tenants to testify in the public hearing scheduled on October 17 when City Planning Commission will collect public comment. Our goal before the hearing is to apply as much pressure on the City Planning Commission because they are mayoral appointees vested with power to deliberate and vote on individual proposals. The general public and residents of this neighborhood will be heavily impacted if the proposal is approved by City Planning Commission. It is not the developers who live in the LES and Chinatown, and so they will not understand the personal, social, financial changes these towers will bring in the lives of seniors, children, and families who have laborious jobs, and are trying to make ends meet. In fact, the amenities, building of a new community center, improving the East Broadway subway station, or playground proposed by the developers is nothing compared to the gravity of displacement, gentrification, and pushing away families who have lived in Chinatown for decades. If you are interested in learning more about this or want to attend the town hall meeting and the public hearing, please reach out to our CTU Lead Organizer, Melanie Wang: mwang@caaav.org. CAAAV’s annual Karaoke Battle: Liberate Your Wildest Dreams! Searching for Deputy Director of Development, Finance and Operations! © 2019. CAAAV All rights reserved.